Commissions are for many of you a great way to get money but reading in the Facebook groups this is also the biggest frustration point. You love drawing and painting and your customer loves what you do. That’s why she hired you in the first place. But you start experiencing stress, exhaustion and de-motivation? Some really hate it. It must not be this way! 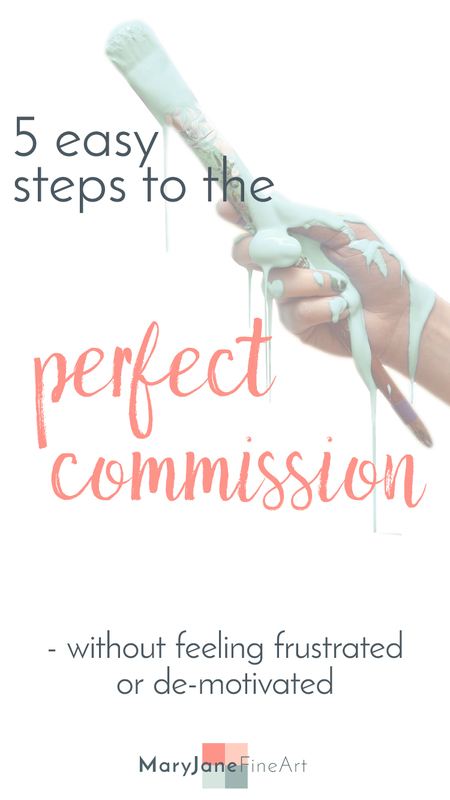 I will share 5 easily doable steps to avoid falling into this trap and getting you the perfect commission. ‘Working on a commission’ ads some extra anxiety to the process and we start doubting ourselves. Doubting our skills. Doubting our prices and so on . . . But you are the artist! Your customer chose you over the thousands of artists out there – some would have been cheaper, some would have a way better skill level. But their choice fell on you. This must mean something. So be confident that you can do this, and don’t sabotage your work. If the Customer trusts in you, you can too! FINALLY! Your first commission, or the tenth – it doesn’t matter. You need the money and are so happy that someone went through with the commission. You need it so ‘desperately’ that you would do anything to get it. STOP right there! If you have an art degree or not doesn’t matter. You have the experience and practice your customer is lacking. So stop doing what your customer wants (okay this might not come through as intended)! What I’m trying to say is that your customer should trust you. This is why they came to you in the first place. I would use something like this in the terms and conditions: they can say their wishes, but the Artwork will be YOUR interpretation of this. That’s why they want a drawing/painting and not just a printed photograph on the wall, right? The personal touch of the artist. And that is YOU. Before you got the inquiry for the commission your customer has probably seen many other artists and checked offers. She chooses you over the others, and you have the same right. You can choose if you are a good fit or if the expectations are too high. Is she asking too much of you and you feel that this is going way over your head? Is she the person that is never happy and hard to please? There is no shame in declining an inquiry. This will prevent you from being stuck in a project you don’t like and that takes all the energy and pleasure out of the creation process. This secures their spot on your calendar and gets your biggest expenses covered. In the past, I was not doing this and planned as I would have this commission, and did not take on new clients. The time came and passed and I did not hear back from them – bummer. I have stopped taking regular commissions but if a project interests me enough and I have the time to fit it into my schedule I require a down payment. This has also another effect. The customer already paid you and is more inclined not to hop off . A commission should be a win-win for both parties. For you, it means you can pay your bills and for the one commissioning you it means a unique memory or present. Is the reference material so bad that you will work double the time on the project? Do you need to use Photoshop to edit it heavily before you can even start drawing? Or Google for a similar breed just to get an idea what the reference picture is showing? There is nothing wrong with adding this to the quote. Have a guideline on what reference pictures are acceptable. Everything that is not needs to be prepared for the drawing first. There is no reason this extra time and work has to be paid out of your pocket. Once you have added this section to your contract/quote people might start sending you better quality pictures. But if they don’t you’ll still be happy – because this means you get paid for your extra work. Have a professional appearance, have a professional contract and have professional prices. People treat professionals totally different as they would hobbyists or ‘friends that can draw’. They expect that you have authority, knowledge, and boundaries. And they know that all this comes with a price. So if your prices are too good to be true they will ask where the catch is (did Google translate this right?). It often ends in a reasoning that you are not that much a professional and that they feel they can tell you what you should do. The perfect commission is no dream subject it is doable! Let me know your number one tip on commissions in the comments below. « How to rock Instagram: what you didn’t know about business accounts? Great article, I have followed these principles from the start and have never had a problem with a client or non payment. My problem recently is getting the commissions in the first place, how do I turn an inquiry into a commission? How is your process? Do you post your prices online? Do you know why they did not go through with the purchase? You would need to look into the answers of these questions to get the HOW. Great article, I’m currently tackling a bit of a tough one at the moment. How would you suggest coming up with a background/background colour? I’m so lost! Often a commission is not on par, artistically with my competition work. That’s ok. I can still charge the same prices because this commission is taking my time away from that other “more artistic” work. Keep that in mind and don’t under price yourself. When some artists are too cheap it makes those of us who want a living wage look over-priced and that is not fair. YES, Love the “Don’t under price yourself” part. I often see people do that. Charge $50 for 20h of drawing ‘work’. HOW? But how does one choose where to start on the “perfect price” for the commission? In my case, graphite drawings. Do some research. See what others with similar work are charging. Then take into account your location, cost of materials, etc. If there is not much competition in the area (aka fewer choices for the customer), you have a high cost of living, or you are taking commissions locally instead of online, adjust your prices accordingly.